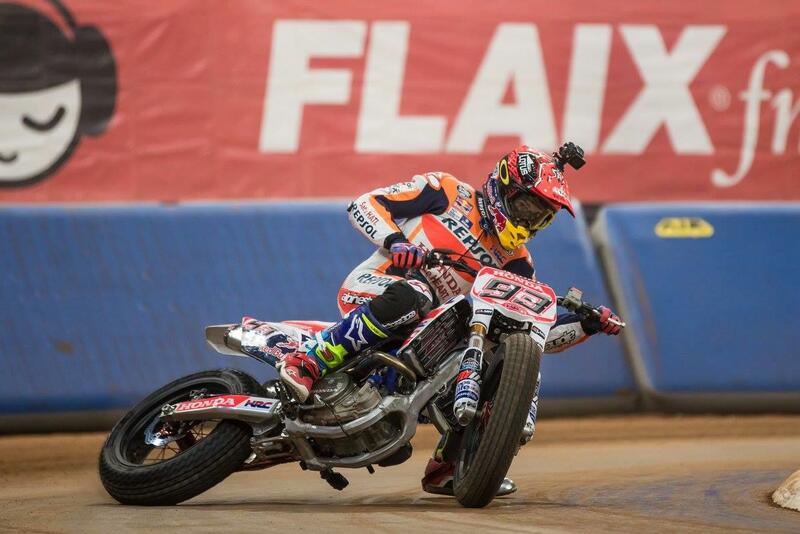 Marc Marquez has beaten flat track nemesis Brad ‘the Bullet’ Baker for the first time at Barcelona’s Superprestigio race, making it two wins apiece for the duo at the race as their friendly rivalry continues at the end-of-season party. Both were fast all weekend in their respective classes taking a win each in the run-up to the night’s top-billed Superfinal event. But a bad tyre choice for the American, opting to go for a new and not used Michelin, left him struggling in the race, ending it third behind Marquez and surprise podium finisher Toni Elias. The night was marred by a number of crashes, with the first turn fall in the night’s first race establishing the precedent for the rest of the event. Ricky Cardus and world flat track champion Francesco Cecchini were among the worst hit, although former Grand Prix racer Julian Simon was another victim, failing to even make racing after a practice fall. It was a bad night for the British racers too, with Oli Brindley the only one to advance out of the heat stages to the finals, finishing the open class in fifth overall.